Our large pack of Corrugated Bug Shapes offers a unique and engaging Arts and Crafts tool for children of all different age groups. 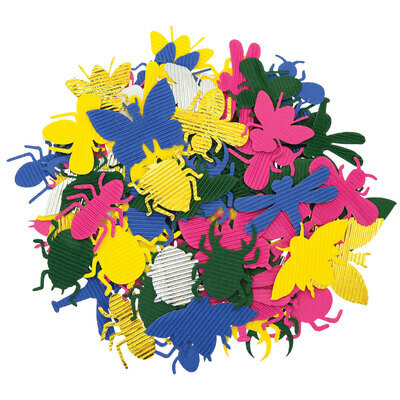 Made from a high-quality corrugated paper making them easy to pick up, these brightly coloured bug cut-out shapes can be used for all manner of crafting projects from templates through to building educational models and forming large displays within your classroom. Die cut for precision and presented in a large pack of 100, you'll discover everything from the common ant through to the beautiful butterfly and everything in between for each child's personal preference. The high GSM paper works well with all manner of adhesives and has a high tear-resistance making them perfect for nursery or primary school children too. Why not choose our Geometric Corrugated Shapes Bumper Asst or something from our Sea Life, Space or Transport collections to pair with your bugs?